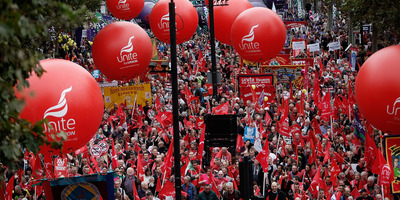 Getty ImagesA workers’ rights protest march in London. October 2014. HMRC is targeting companies which advertise unpaid work. More than 500 were contacted since November, with plans for more. Genuine voluntary unpaid placements are legal, but any position with fixed hours and defined work must be compensated with hourly pay. Officials doubled the budget for tackling unpaid work, to £25 million. The British government has sent letters to 500 companies telling them to start paying their interns as part of a new wave of measures against unpaid work. Officials at HMRC, the UK’s tax and revenue department, are contacting around six employers every day to remind them that advertising for free work is often illegal, and can result in large fines. Enforcers trawl job listings for unpaid internships, and contact employers to remind them that in many cases they are legally obliged to pay staff. An official government response to the Taylor Review of working culture in the UK detailed the enforcement regime, saying that more than 500 employers had been contacted between November and the start of February. UK law does allow for brief placements by genuine volunteers, who are defined by a lack of fixed hours and responsibilities. The response said that the government had also almost doubled its budget for minimum wage enforcement this year, from £13 million to £25.3 million in the next tax year. If the problem persists, they said, the government will look at more aggressive methods of tackling the problem. Business Insider offers a variety of paid internships, which are listed here.